This morning I heard echoes of Reagan in Senator Ted Cruz’s speech and an historical shiver went down my spine. His announcement from Liberty University was concrete proof that Cruz is undoubtedly one of the most brilliant and gifted speakers ever to grace a political stage. He doesn’t bother using a teleprompter because what he says comes from his heart – it is second nature and honest. He made his presidential announcement in Jerry Falwell’s place – the very lap of the Moral Majority. And much to the Left’s chagrin, he has morals, principles, ethics, faith and a spine. This is a man not afraid to get down on his knees and pray. It’s like throwing garlic in the face of a Marxist vampire. 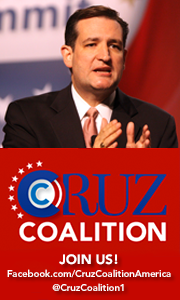 The Left and the Right are terrified of Ted Cruz – he is the people’s choice. And there is not a candidate out there that is more positive, more gifted, more masterful and more charismatic at stating strongly what conservatism truly is.